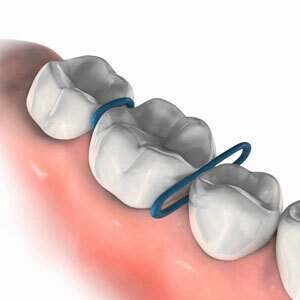 The purpose of spacers is to move your teeth apart slightly in order to make room for the back braces (bands). On your next appointment, the spacers will be removed and bands will be fitted on your teeth. The spacers can make teeth sore. If soreness occurs, eat a softer diet and take Tylenol or Advil. Avoid sticky foods and flossing between the affected teeth, as this may cause the separators to come out early. Also avoid clenching and picking at the spacers. As your teeth move apart, the spacers will eventually fall out. If some fall out before your next appointment, no need to replace them. Just keep you next scheduled appointment. Remember, proper care of the spacers will make your job and our job easier when we fit the bands on your teeth.